A year ago I was knee-deep in iPad apps, sifting for gold among sludge as I combed for Best iPad Apps–worthy entries. My next book has me back in waders, this time looking for innovative, user-friendly digital books. Seems like a shame to wait for the pub date to share my findings. What follows, then, is an early snapshot of some of the best of what I’ve seen. You’ll no doubt notice a heavy bias towards iPad apps. Partly that’s because of my previous research, partly it’s because of where developer dollars are flowing. Still, not everyone has the same taste in fruit. Please, please dear reader: help me make this a less Apple-centric list by sending me your suggestions (my contact info is at the end of this post). PR overtures are welcome but, hey, channel the spirit of Twitter: keep the pitches brief and send them in English-major-friendly English, okay? 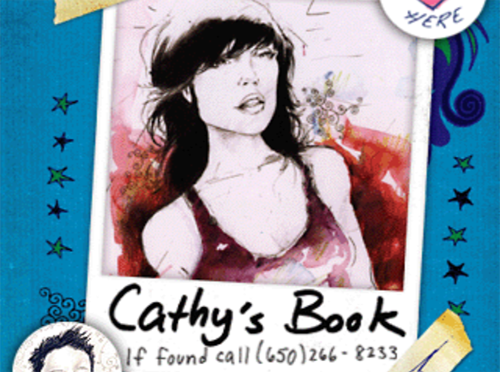 An iPhone app implementation of a print book that, impressively, does loads that can’t be done in print: animated renderings of the narrator’s sketchbook drawings; voicemail phone clues that contribute to the story; and audio/text mashups that are more than simply a recorded version of what you can read onscreen. The designers have even done a great job of moving between regular text and brief animations. That one’s tough to pull off in a way that maintains the “reading line”: the storytelling momentum that pulls a reader along from start to finish. 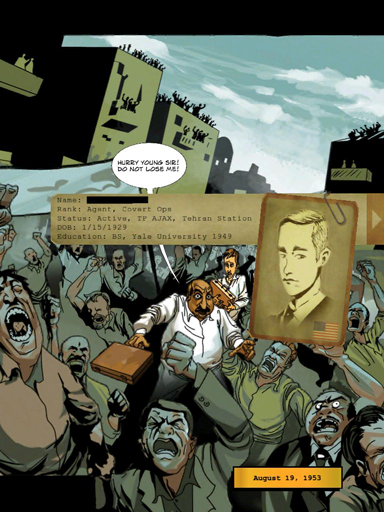 A “motion comics” version of the CIA’s involvement in the 1950s Iranian revolution. Much more than a digital replica of a graphic novel; the action moves within and between panels. Plus, research dossiers are available for all key characters (rotate the iPad from portrait to landscape to see these) for when you want to learn more about the main players. 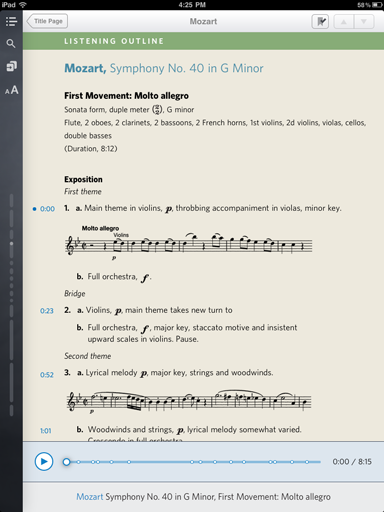 Some very cool annotated musical scores here let students read captions, listen to the recording, and see what parts of the score are being commented on as the music plays. A digital version of the traditional field guide. 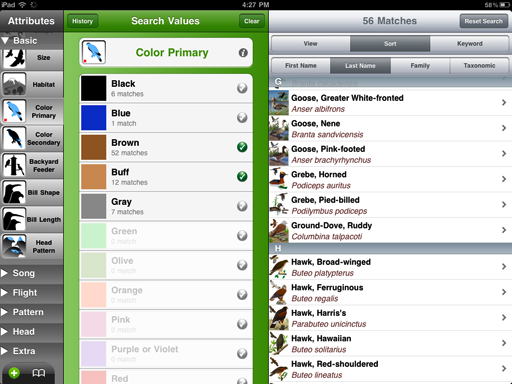 Great search feature lets you select one of a half dozen characteristics you’re interested in (Size, Habitat, Color, etc.) and then input particular values (big, Hawaii, red, etc.). Very neat way to search through 1,000 or so bird profiles and winnow down the list to match the ones that meet your criteria. Another to-be-expected but quite well done feature: recordings of all the various birds. 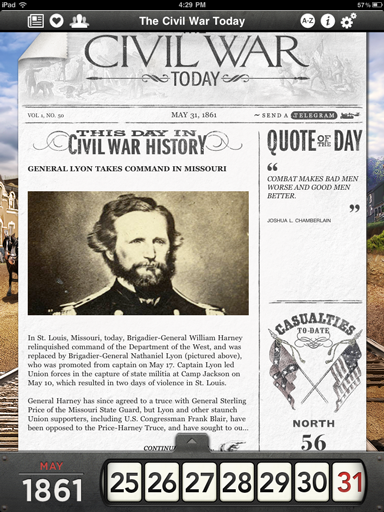 A history of the Civil War presented as a collection of “you are there” archives (diary entries, newspaper articles, photos). Each day over a 500ish day timeframe, a new day’s worth of archival material is released. Your relationship to the book therefore plays out across the same time span as the war itself did. Layout is also innovative: the whole thing is done up as a 19th century style newspaper rather than a book’s traditional table of contents. Interesting effort from the NY Public Library to present a collection of everything they’ve got on the 1939 World’s Fair. 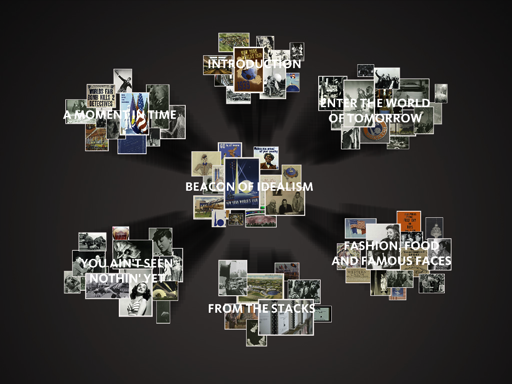 At heart it’s simply browsable articles, photos, and other source material from the library’s archives. But there’s a couple of innovative (and, for my money, slightly overdone) navigation and presentation features. For example, rather than a text-only table of contents they’ve identified a half dozen or so themes and constructed a 3D-ish wall of icons you can browse through to explore each of these groups. 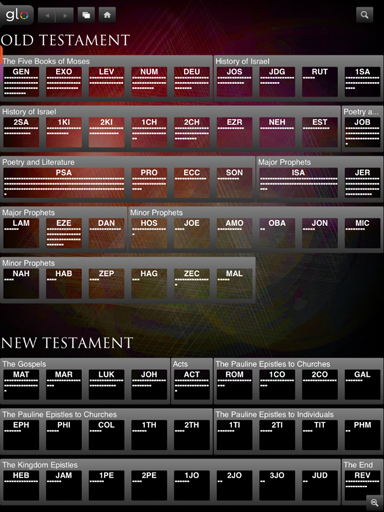 Bible reading app with some nifty features, including a zoomable book view that lets you go from a high-level view of all the books in the Old/New testament, down one magnification level to a view of one book (say, Exodus) and all its chapters, and, finally, down to page-view level. In other words: it’s a great way to switch quickly from birdseye- to page-view level. Another Bible reading app. Filled with some powerful reader aids: lots of links within the text between different books; pop-up definitions of archaic terms; text comparisons (so you can see how the text varies between different translations); cross-reference previews (brief glimpse of the referenced text so you can see what the link is pointing towards before clicking it); and a dual-pane reading view so you can have multiple texts onscreen at the same time (e.g. the Bible and some commentary). A collection of historical essays, photos, and illustrations that offer a multimedia history of Rome. 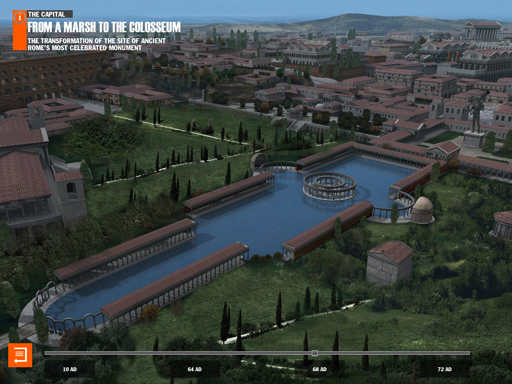 Particularly innovative features include: Overlays (move a slider and watch how a marsh in Rome changed from, say, 10 A.D. to the Colosseum in 72 A.D.) and virtual reality views (called “Bubble” views) that you can explore by moving your iPad around to pan across the scene. Okay, here’s proof that the best action isn’t happening only on the iPad. A digital book released earlier this spring, this one’s web-based (and Flash-based, to boot). 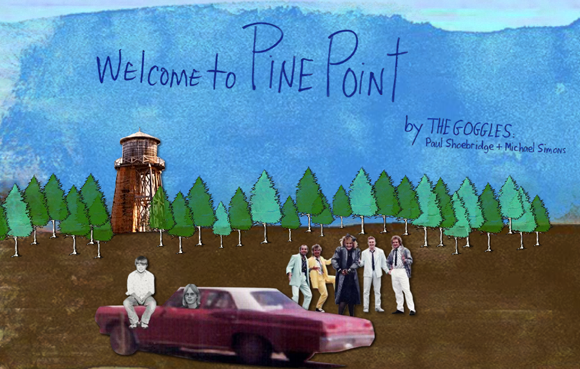 It combines video, text, and audio to tell the story of what happened to a town abandoned by the Canadian government. All in all, it’s a really powerful tale and incredibly thoughtful integration of all the different media elements. What’s crossed your radar? I’d love to hear; email me at peter dot meyers at gmail dot com. Webcast: Digital Bookmaking Tools Roundup — Pete Meyers looks at the growing number of digital book tools: what’s best, what’s easiest to use, and what’s worth putting in your book-building toolkit.